MicroMax’s Quad Core rugged industrial computer for tough environments, M-Max 771 PR7, based on the VITA 75 standard has passed standard military tests. It has been certified to comply with MIL-STD-810G (Method 501.5 — High Temperature (Procedure II) +70°C, Method 502.5 — Low Temperature (Procedure II) −40°C, Method 514.6 — Vibration (Procedure I) — Category 14 (Helicopter), Method 516.6 — Mechanical Shock, Procedure V, Crash Hazard) and airborne MIL-STD-704F (Voltage Distortion Spectrum, Steady State Limits for Voltage (Emergency), Starting Voltage Transients, Power Failure). The lightweight compact sealed case resists contamination and humidity, providing IP66 protection level. The system is equipped with Intel Quad Core processor, 4 GB of RAM and can house a storage device up to 1 TB. Soldered RAM and industrial grade SSD provide high reliability. Intel HD Graphics integrated controller supports displays with resolution up to 2560×1600 pixels. Standard configuration includes 16 DIO lines. Optionally includes sixteen 16-bit analog inputs, four 16-bit analog outputs and six additional digital I/O lines. The system is housed in a new version of the M-Max V75 chassis. 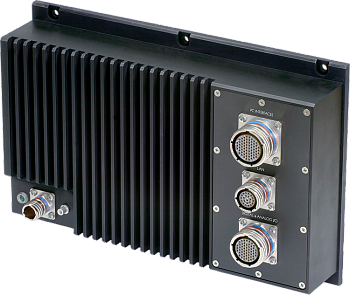 This fully sealed rugged enclosure is designed according to the VITA 75 footprint. It was developed to build high performance PC/104 systems that offer high reliability by passively dissipating heat without moving parts. This version is highly customizable and provides even greater flexibility due to the new layout.